The True Gossip Home / MILEY AND NICK HAVE LUNCH...NO JUSTIN? MILEY AND NICK HAVE LUNCH...NO JUSTIN? SURPRISE! 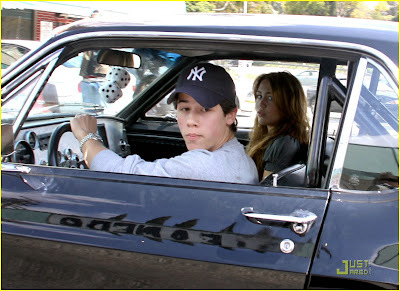 Nick Jonas drove Miley Cyrus to lunch in his Mustang Cobra on April 11. The exes ate at The Village Idiot in Los Angeles. The two reunited to talk about music! Miley updated her Twitter while with Nick, "eating lunch and talking about music with an old friend." Nick got into a little fender bender while driving out of the parking lot. UH-OH!! One Response to MILEY AND NICK HAVE LUNCH...NO JUSTIN? They really looked good together. I feel bad for JG. Is Miley cheating on him? hmmm.